Kroger is at it again with another chance to win free products! Go play the March to Savings instant win sweepstakes for your chance to win digital coupons for free products! Remember to register your Kroger card on Kroger's website so you can download digital coupons to your Kroger Plus card. There's no easier way to coupon than for them to do it for you! Take advantage of this offer - you can play every day for the next 13 days! 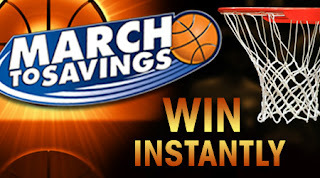 I hope to hit this March to Savings sale within the next couple of days. After I do, I will definitely be sharing my trip with you so you can take advantage of the great deals I find.